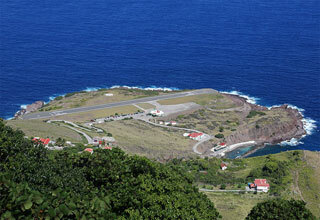 Juancho E. Yrausquin Airport in Saba has the shortest international runway in the world. The side by which aircraft come in is flanked by a large cliff that the plane flies directly toward before banking hard left to get in line with the runway. The airport is 60 feet above the ocean, and sheer cliff on both sides of the runway leads to those rocky depths, running the risk of airplanes over shooting the runway and falling into the ocean. This article uses material from the Wikipedia article "Saba Airport", which is released under the Creative Commons Attribution-Share-Alike 3.0 License.